This is going to be my very next dinner party recipe, I swear. Followed by revani for dessert! A few days ago, I thought some fish for dinner wouldn’t come amiss after what seemed like a lot of meat recently. We actually prefer fish and I buy it regularly. 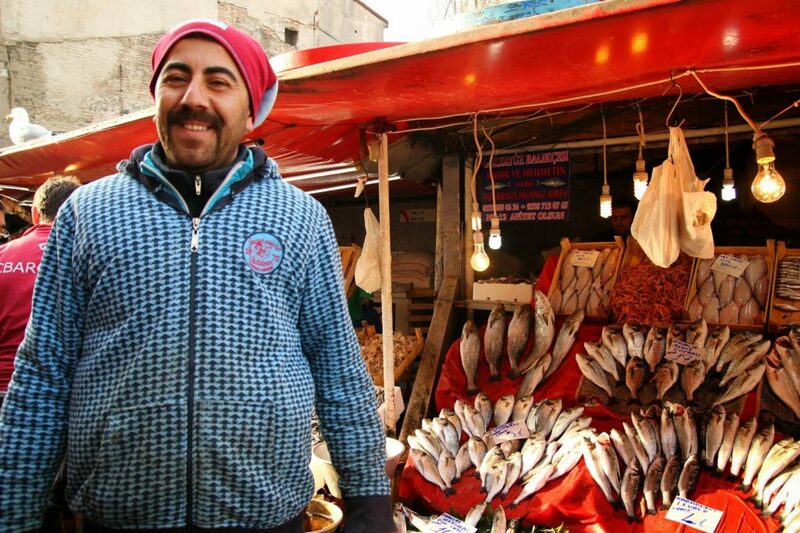 I love the fish markets either in Karaköy or Kadıköy – so much more attractive than the rather sterile fish counters in the supermarkets. Having said that, they don’t clean fish better than in the Migros in Caddebostan! 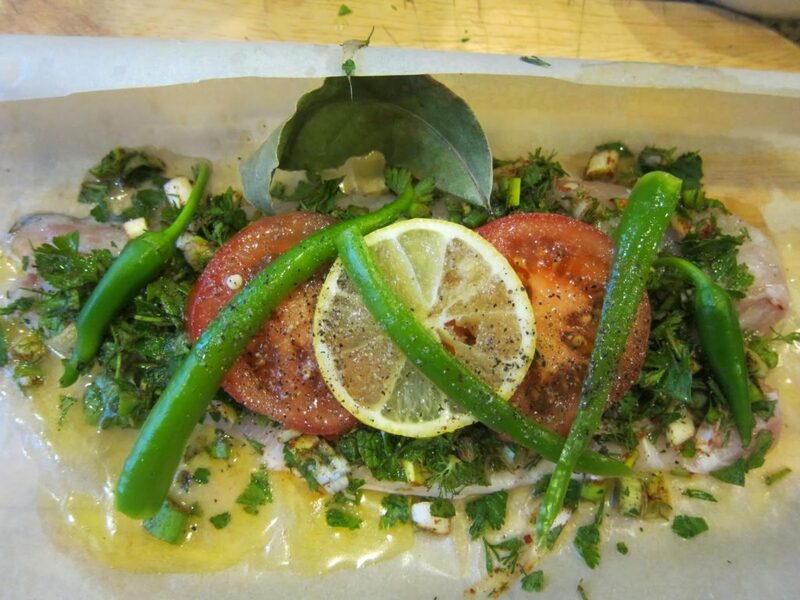 This recipe where the fish is baked in kitchen paper/parchment is superb: not only does the fish remain moist but because it is smothered in a layer of fresh herbs, not to mention with the addition of rakı/the Turkish national anise-based drink means that the fragrant aroma upon opening up the parcel is just irresistible. Talk about ‘opening up your appetite’! Here, I used levrek or sea bass but you could equally use any firm-fleshed fish. Levrek is farmed extensively in this country. TT swears he can tell the difference between that and regular sea bass. I can certainly tell the difference in the price! Cut 4 pieces of kitchen parchment into rectangles large enough to enclose a fillet of fish. 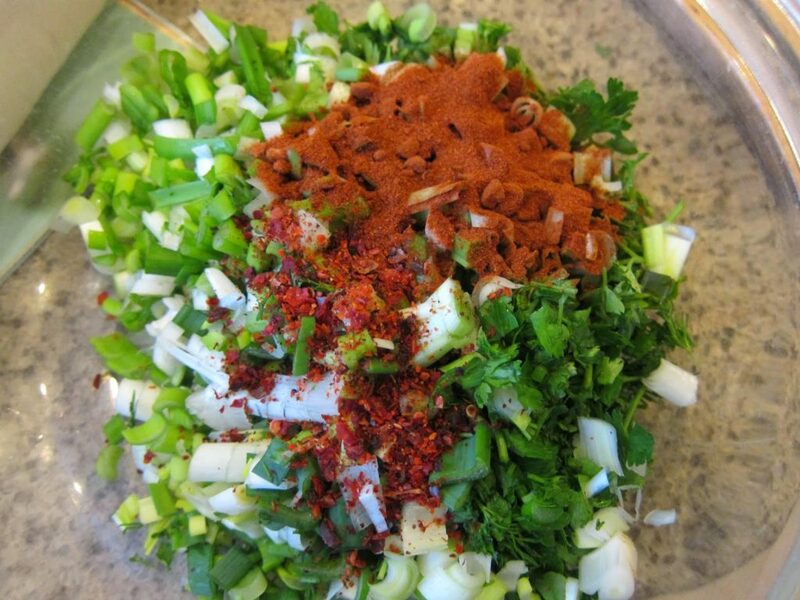 In a bowl, mix the spring onions, parsley, dill, mint, paprika, and red pepper flakes. Season with salt and pepper. 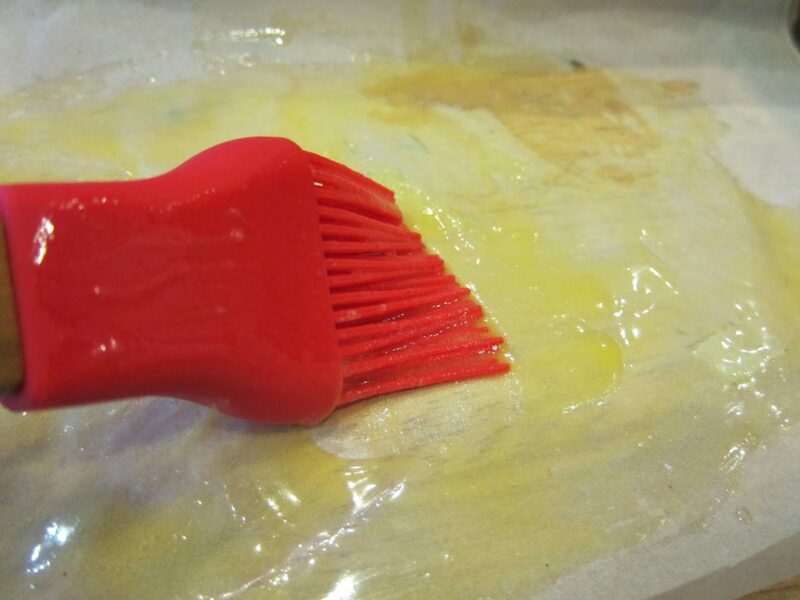 Heat the butter and brush each piece of parchment with it. Place a fillet in the centre of each sheet lengthwise. Place a bay leaf on top of each fillet. 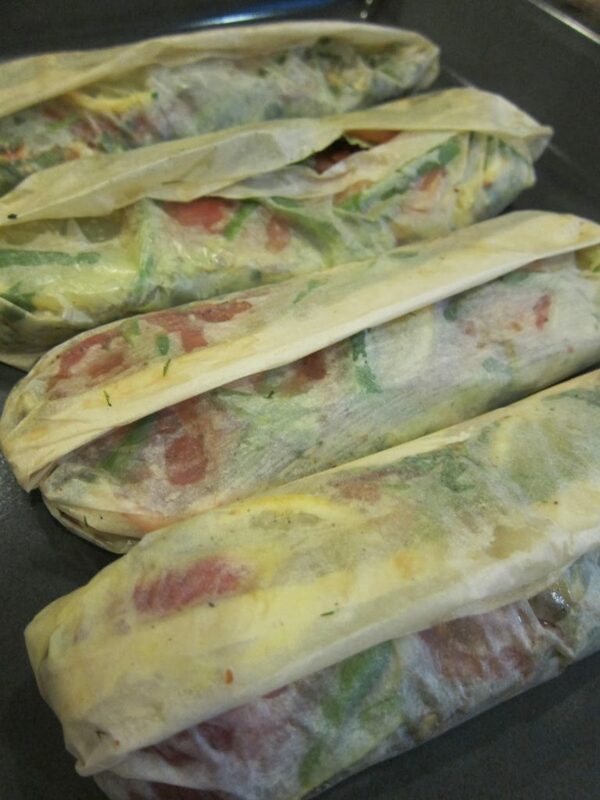 Evenly distribute the spring onion-and-herb mixture among the parcels. 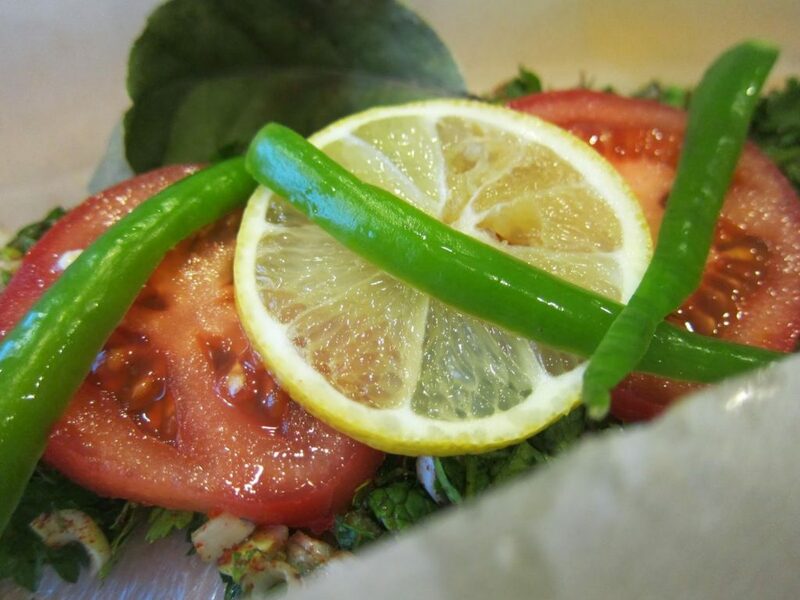 Place the tomatoes, green peppers, and sliced lemon on top. Sprinkle each parcel with 1 tbsp each of the lemon juice, olive oil, rakı and water. Season with salt and pepper. 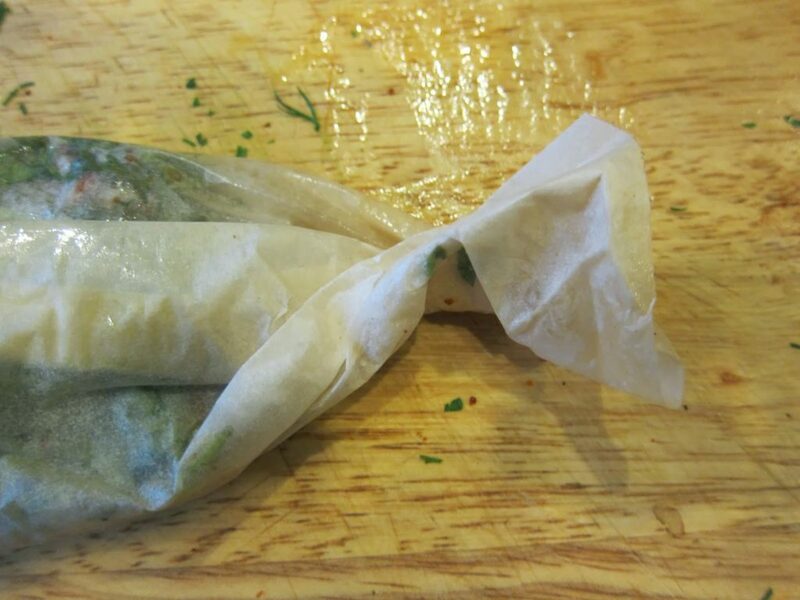 Make an envelope out of the parchment by bringing the top and bottom edges of the parchment together in the middle over the fillet, and folding them down together (as if you were folding down the top of a lunchbag) to enclose the fish tightly. Twist both ends like a candy wrapper (sweet paper to us) and fold them under the fillet. Moisten the tops of the packages with a little water to help make a tight seal. Place the packages on a baking tray and bake them for about 25 minutes. 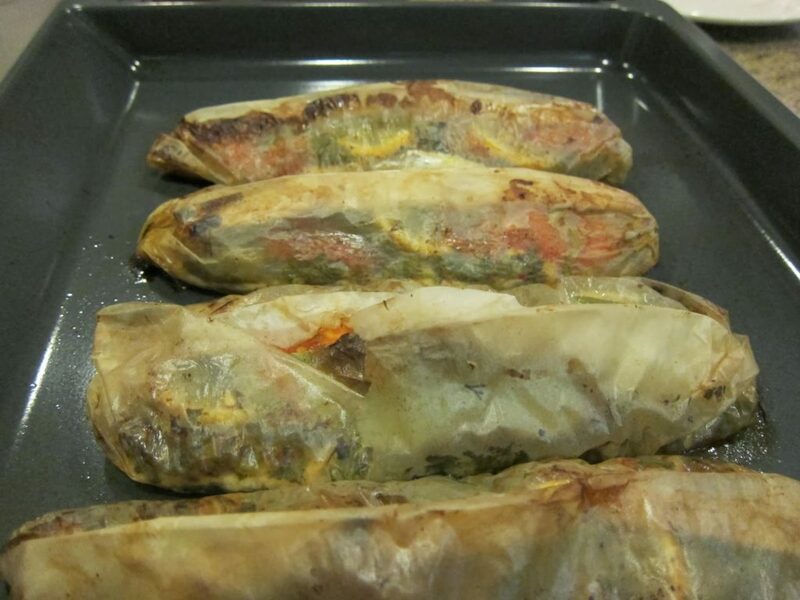 To serve: open the packages halfway (be careful of the steam) and place one package on each plate. 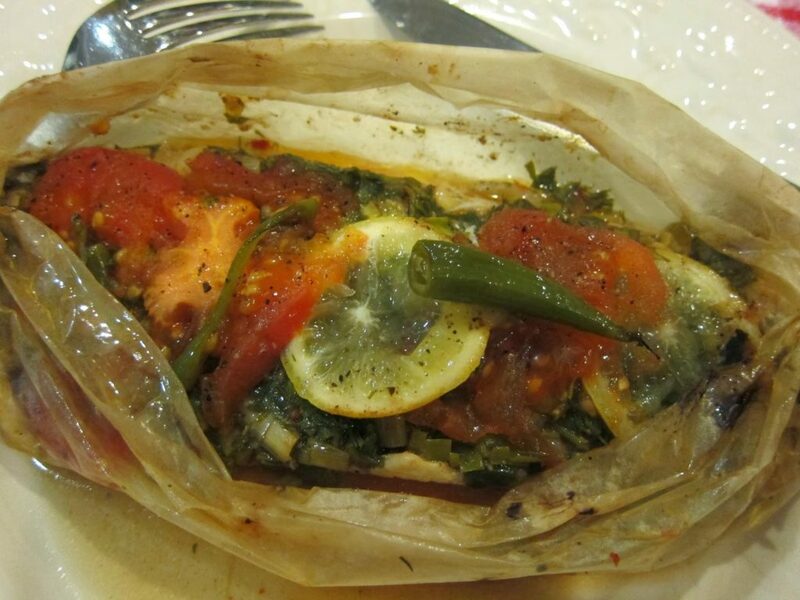 And here we have the baked sea bass in parchment with rakı and herbs! Afiyet olsun!PS While I was waiting for my levrek to be cleaned, I noticed that the other guy who was filleting a ton of hamsi had surreptitiously put a whole lot in my little plastic container. Are you giving them to me, I silently mouthed in Turkish and he smiled and nodded.